To be at Heron Creek Golf and Country Club is to discover a mother lode of residential and lifestyle amenities that boost real estate market values of the properties located in this community. This country club community is a 676-acre gated development masterfully built in the city of North Port, southern Sarasota County, Florida. It can be easily reached via Exit 182 between US-41 and I-75, then off to the city’s S. Sumter Blvd. Life within this enclave revolves around an imposing clubhouse providing numerous amenities including tennis and golf facilities, and a residential community amid a pristine natural environment. The Heron Creek Clubhouse is a 21,000 square-foot-structure in a classic colonial architectural style. It has two levels, with the upper main floor housing the dining areas, kitchen, meeting rooms, restrooms, and administrative offices. Patios and decks are adjacent to the dining rooms. The Golf Pro Shop, men’s and ladies’ locker rooms and restrooms, and golf cart storage are at the lower level. Member dining privileges are provided at The Heron’s Roost, a grille room suited for casual lunches or dinners. Dining in elegance is accorded at the Top of the Green that can accommodate up to 150 people. It boasts an extensive wine collection, and a comfortable and fine interior design suitable for cocktail gatherings. There’s also The Creekside Café serving lunch and dinner as well as drinks at the clubhouse patio or by the poolside. Tennis playing privileges are enjoyed in five state-of-the art Har-Tru courts with Hydro/Fast-Dry features and lighting for night matches. Adult and junior training programs are available under the supervision of USTPA-accredited instructors. The Heron Creek’s Tennis Center also facilitates member participation in local as well interclub and league tournaments. Essentials for playing tennis are accessible at the Tennis Pro Shop which also provides racket stringing and maintenance. Still more privileges are offered at the club’s air-conditioned fitness center with modern facilities and equipment including locker rooms and sauna. Nearby this center is a resort- style swimming pool and spa. A 27-hole golf layout designed by the well-known course architect Arthur Hills is yet another facility which enriches membership privileges at the Heron Creek. 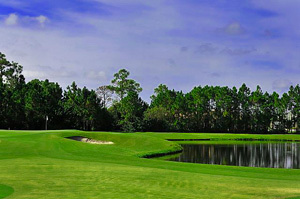 The course consists of the Oaks, Marsh, and Creek layouts, all offering a variety of challenges and elevation changes meandering through scenic greens and fairways. The natural features of the locality, including marshes, waterways, and sprawling oak trees, were masterfully incorporated into these layouts encompassing more than 430 acres. A comprehensive learning program is available in the club, providing lessons to players of all levels and covering every facet of golf—from the short to the long game. An ample area has also been provided for game practice and includes three bunkered pitching and chipping greens, and two expansive, undulating greens for putting. 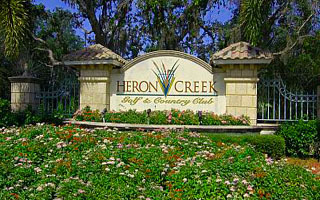 There are several categories of club membership in Heron Creek. The Platinum and Gold Golf Members enjoy unlimited use of all club facilities with specific dues and priorities in golf and tennis scheduling. A Sports Membership grants unlimited access to tennis and fitness facilities as well as participation in all clubhouse socials. The package for Social Membership includes unlimited access to all club activities and socials. Corporate and Seasonal memberships for golf and sports are also offered. Approximately 200 acres of Heron Creek is devoted to a residential real estate community. The home sites here are suitable for single-family homes with floor areas ranging from 1,600 to 2,500 square feet. Prices of the home sites range from $59,900 to $75,000. The residences in the community will enjoy gorgeous views of the golf course. Only builders with excellent track records of service are accredited to the construction of homes at Heron Creek. The completed Heron Creek homes for sale in the neighborhoods are quite spacious. A home with a pool and 2,072 square feet of floor area can be listed around the $300s level. A larger residence with a 2,562-square-foot floor plan and also with a pool can have a tag price of $475,000. Price per square foot, Herron Creek homes for sale represent a great value when considering the amenities that are offered in this country club community. 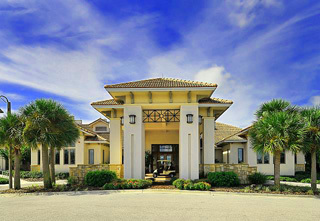 A residence at Heron Creek will be most ideal for retirees as well as growing families. Excellent schools in the middle and high school levels are in close proximity to the community. A new Towne Center is being developed adjacent to the country club, a commercial real estate project being undertaken by Heron Creek’s developer. This modern commercial center, in addition to the amenities already existing within the golf community, should indeed be further reason to invest in Herron Creek real estate. Below are all of the current real estate listings available at the Heron Creek Golf and Country Club.